Homewares store Didriks, and Local Root, the kitchen store are opening soon at 77 Leonard St. in Belmont Center. 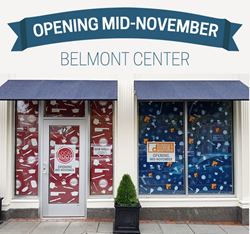 Didriks and Local Root have moved their Cambridge location to a new space in Belmont Center and will be opening Mid-November, with a grand opening on the first weekend of December. The former Macy's building on Leonard street has been remodeled to include several new tenants, including locally owned stores, Didriks and Local Root. The property is located right off the route 2 corridor and is only 10 minutes from Cambridge. The new development is "one of the most exciting retail developments in the Greater Boston area,” said owner, Jonathan Henke. The close to 4,000 square foot space will feature two floors of products for the home. Local Root, the kitchen store will host a selection of cookware, bakeware, knives and kitchen accessories from brands including Breville, Le Creuset, All-Clad, Staub and Zwilling. It will be located on the upper level. Didriks, on the lower level, will showcase fine outdoor furniture, linens, dinnerware, glassware and home accessories. Featured brands include Alessi, Brahms Mount, Chilewich, Libeco, Simon Pearce and more. Additionally, customers will also enjoy plenty of parking and a wide variety of other shops in the area. The store will be handicap accessible and will be open seven days a week. Didriks is located at The Mill at Newton Lower Falls, 2284 Washington St, and will be opening soon at 77 Leonard Ave in Belmont, Massachusetts. For more information, call 617 993-3188 or visit the web site at Didriks.com.